Health and Care Innovation Expo 2019 will run for two days on 4 and 5 September 2019 at Manchester Central. 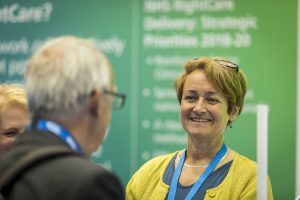 The 2019 event will be focused on the implementation of the NHS Long Term Plan – inspiring, uniting and informing the health and social care sector to lead change. To ensure that Expo captures the full spectrum of collaborative and individual work across all types of public and private sector organisations working towards improved health and care, we want to hear from you! Leaders and innovators at local, regional and national level and right across the health and social care sector were invited to lead educational, interactive sessions in our Theatre and Pop-up university rooms. The application window has now closed, and we are in the process of assessing all bids. We aim to respond to all applicants in June. The Expo 2019 Feature Zones have now been confirmed. This year, we are inviting applications to run 20-30 minute sessions in the Feature Zone mini-theatres. These short sessions, with audiences of a maximum of around 30 people, particularly lend themselves to promoting and sharing great local case studies of individual improvement projects.